One of the things I like to do is see the sights. I love it when you find things you wouldn't normally come across by just running the normal quests. In Stormwind Harbor, if you stay on the upper level and go all the way to the north end of the harbor, you will find Thargold Ironwing. If you talk to him, he will offer to give you a free tour of the harbor. Well, of course I had to go! The gryphon who flew me around provided a very smooth ride; no loop-de-loops. But there was no informative commentary either. 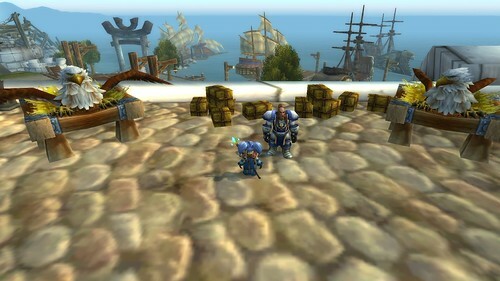 Stormwind could fatten the official coffers by offering those tape recorded commentaries you can get at art exhibits. The flight takes you way out by the lighthouse and I had to hang on as we came pretty close to the light. I have to say, they should also offer sunglasses for when you pass through the lighthouse light. It was a lovely flight and a great way to see a different side of Stormwind. Plus, you don't have to tip your driver.